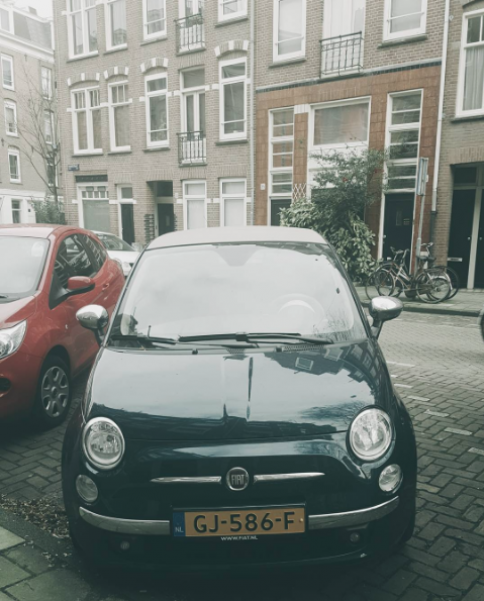 I stopped having a car ever since I moved to Amsterdam, about 8 years ago. Just for the simple reason that I (and most of the people here) don’t really need a car in the city, especially if you live in the city. Everything and everyone is reachable by bike. Through the years I started missing a car so badly, because I really hate public transport and I have a lot of friends and family living in other cities. My family for example lives in Arnhem, which is a 1,5 hour by train from Amsterdam. When I was chatting with the PR manager of Fiat Netherlands, he told me that I should really have a car. At first I hesitated, because I really don’t need a car, except for family visits. He insisted, that I should try it out and see if I actually do or do not need a car. Because I live in the city center and there aren’t a lot of parking places, he suggested the Fiat 500; a small and perfect urban city car. You can get a few more features in the Fiat 500 than you’ll find in most other small city cars, like leather heated seats and rear parking sensors (love this), and there are some 500,000 different build combinations thanks to plenty of possibilities for trims, colors, and accessories. The basic Fiat 500 three-door hatchback is available in four trim levels: Pop, Sport, Lounge, and Gucci; Convertible models are only offered in Pop, Lounge, and Gucci trims for the fashion victims. For the coming months, the Fiat 500 will be my car and I will find out if i’d rather ride my bike and use the train… or go chilling with this car.